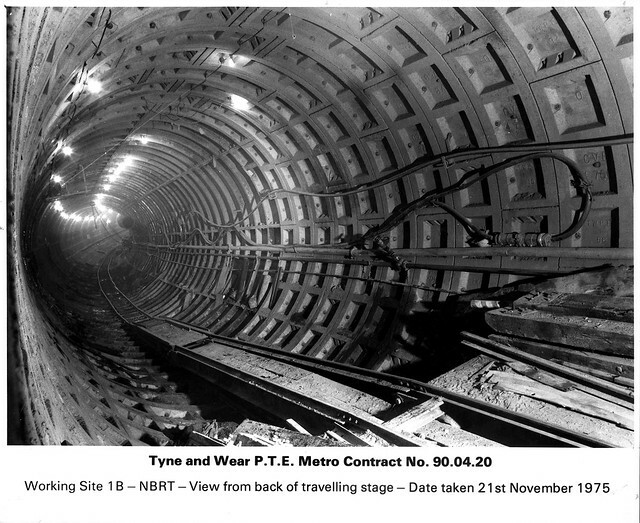 This collection of images documents the construction of the Tyne & Wear Metro System during the 1970s and 1980s. 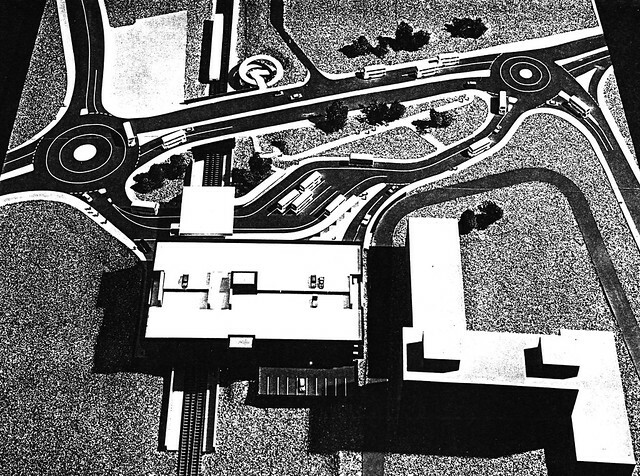 The civil engineering project was overseen by Consulting Civil Engineers Mott, Hay and Anderson. 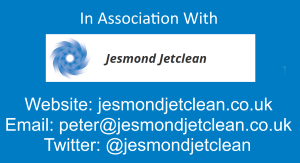 The project was documented by several local commercial photographers in Tyne & Wear. 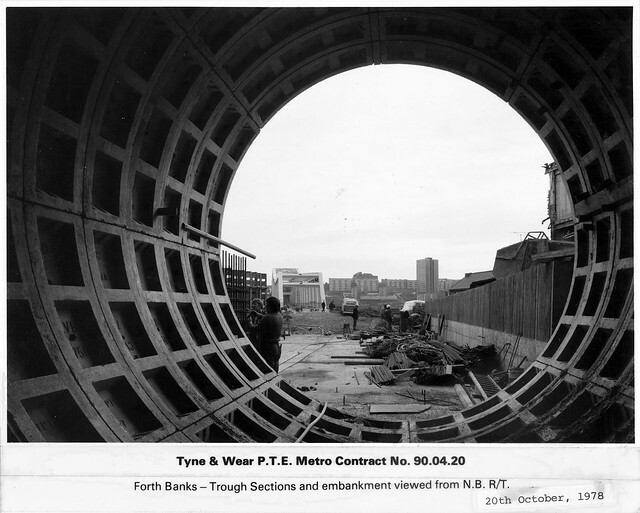 The images are taken from the Mott, Hay and Anderson collection, consulting civil engineers responsible from the Tyneside Metro light rail system and the Tyne Pedestrian, cyclist and vehicular tunnels. 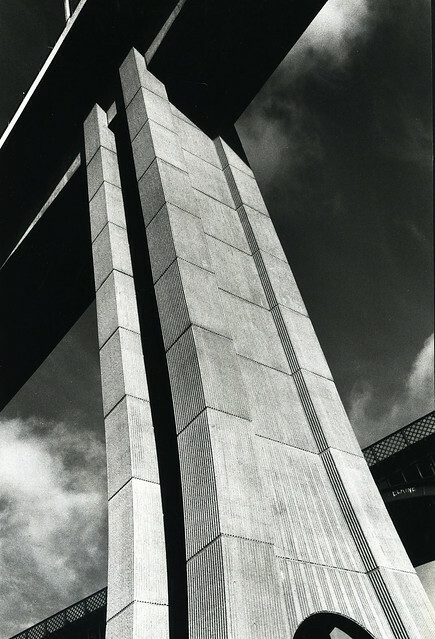 The collection is held in Tyne & Wear Archives. 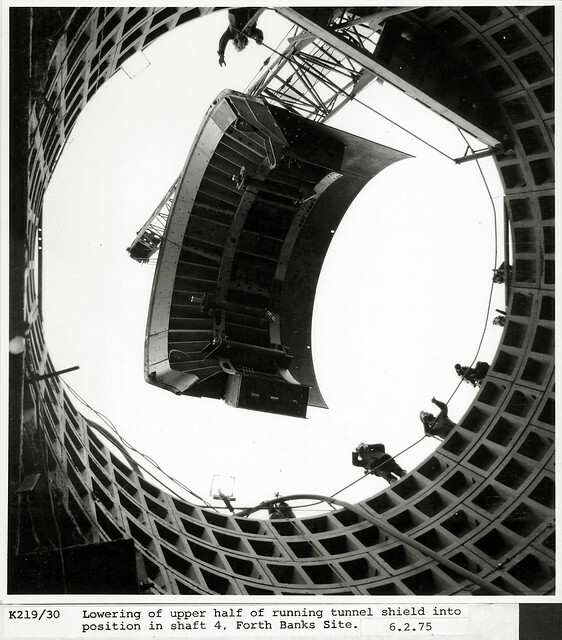 These images were sourced for the experimental film and album of music ‘Interchange’ by Warm Digits. 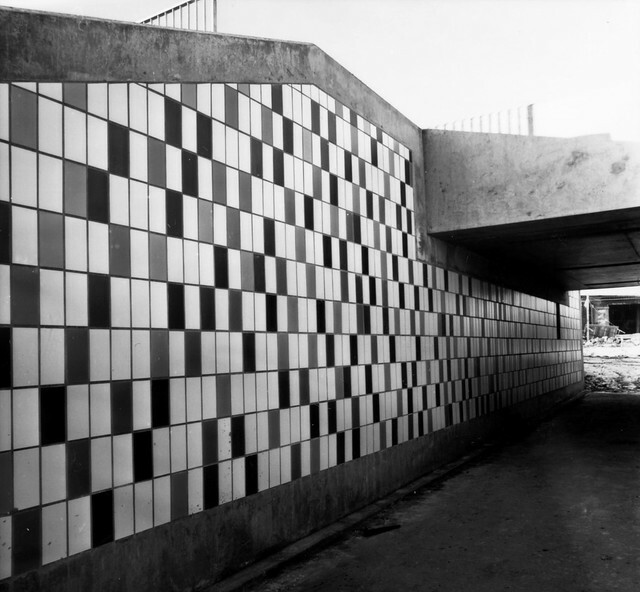 'Interchange' was produced as part of Half Memory, in collaboration with Tyne & Wear Archives & Museums, Pixel Palace, Basic FM and Tusk Music. 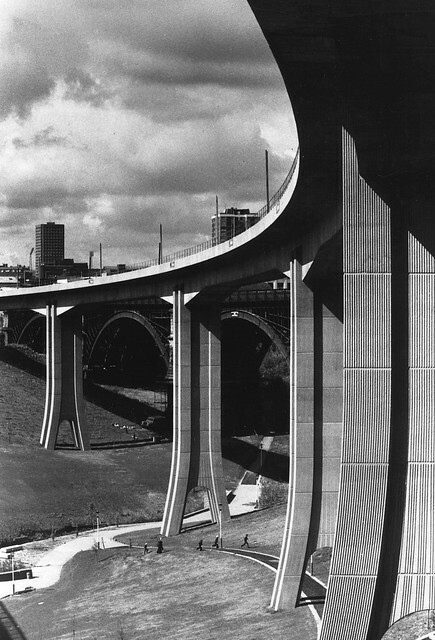 The photographs above shows a completed view of the Byker Viaduct in the summer of 1979. 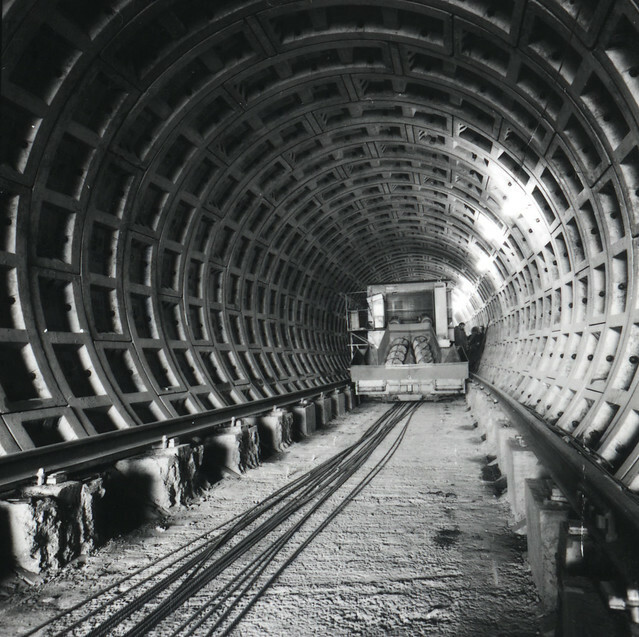 This photograph is a View of the North Bound Running Tunnel Shield on its Erection Plinth. 11th February 1975. 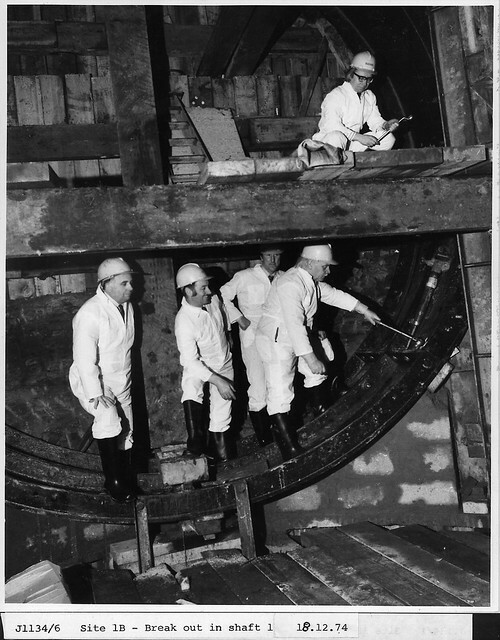 This photograph shows a group entering a Metro Shaft. 18th December 1974. 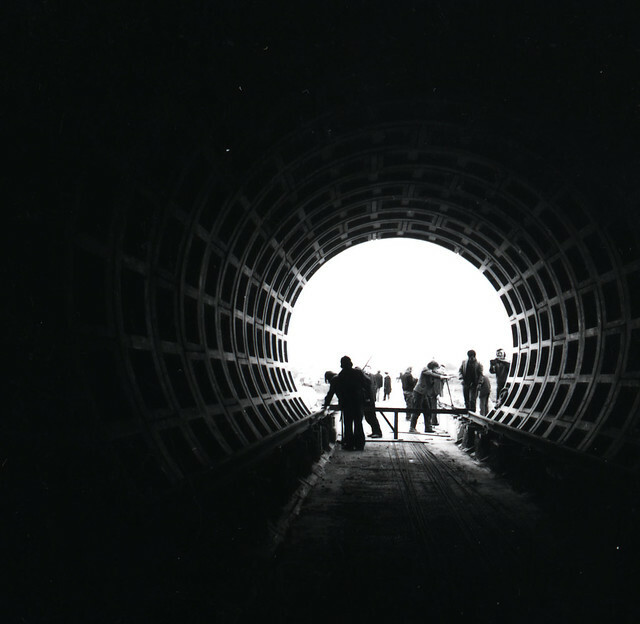 This photograph shows the lowering of the upper half of a running tunnel shield in to position on the Forth Banks Site, 6th February 1975. 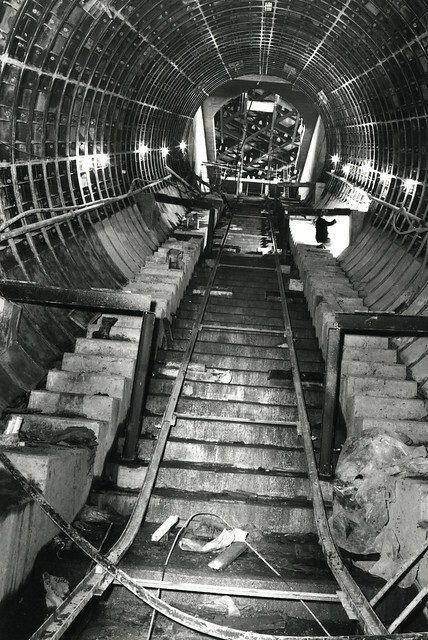 This photograph shows the excavation and construction of the escalator shaft at Haymarket Station. 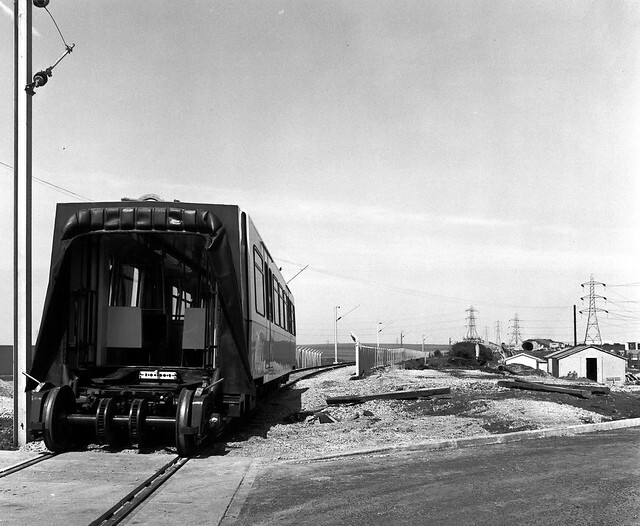 This photograph is a view of the North South Line to Jesmond, documenting the right hand drive tunnel. 11th June 1975. 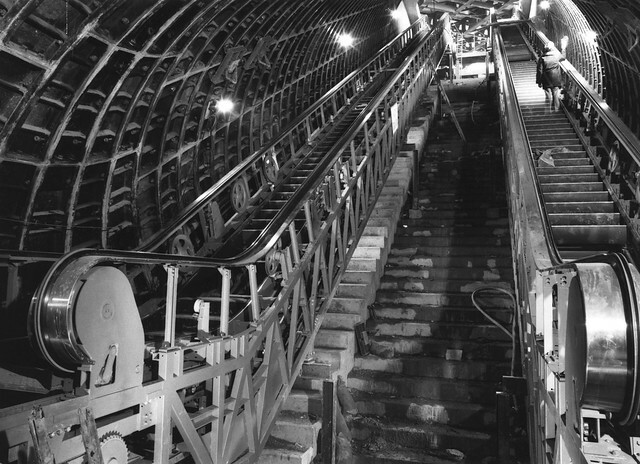 This photograph is a view from the back of the travelling stage of the South Bound tunnel to Haymarket, 21st November 1975. 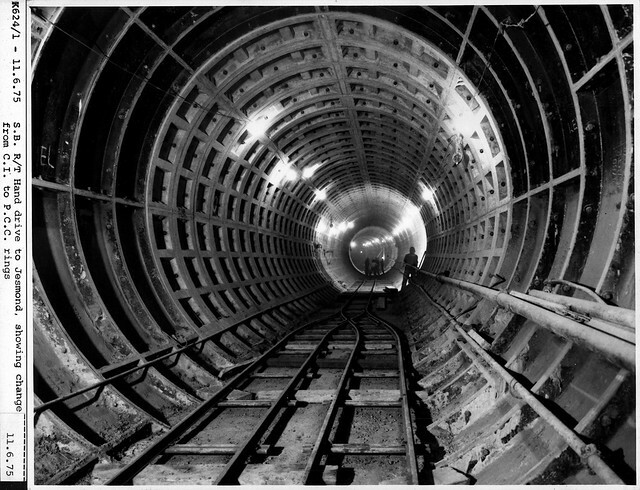 This photograph is a view of the south bound tunnel to Haymarket. 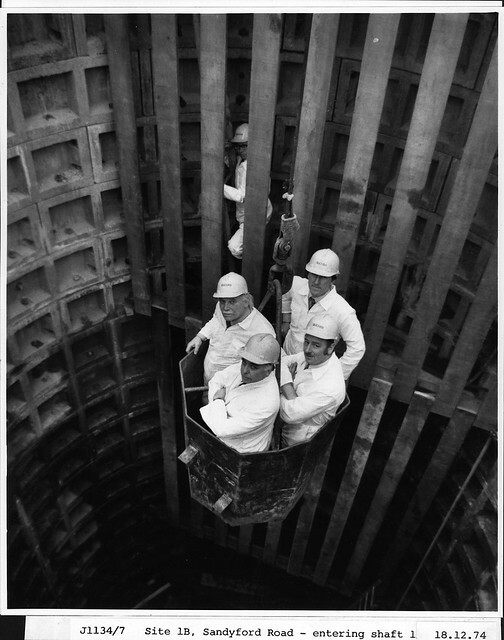 This photograph shows a group in a Metro Shaft. 18th December 1974. 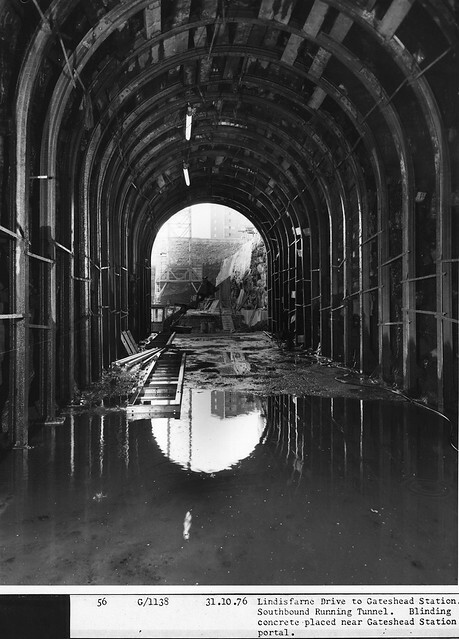 This photograph is a view from the North Bound Step Plate Junction looking north, viewed from the Crossover Tunnel. 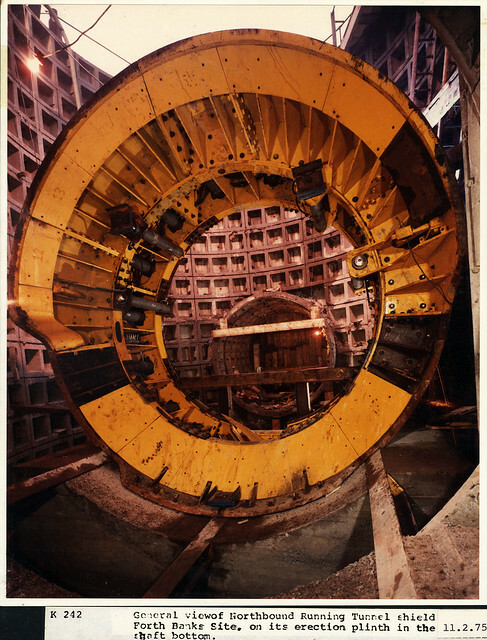 December 1978. 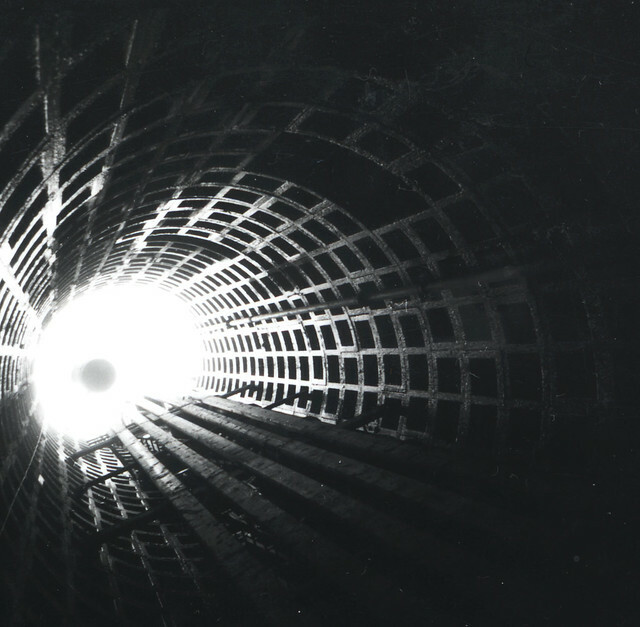 This photograph is a view of the bottom of the metro shaft at Argyle St. in Gateshead. 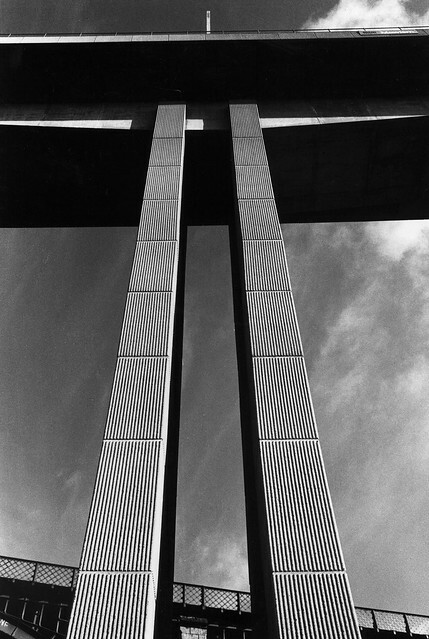 It was taken at some time in 1975. 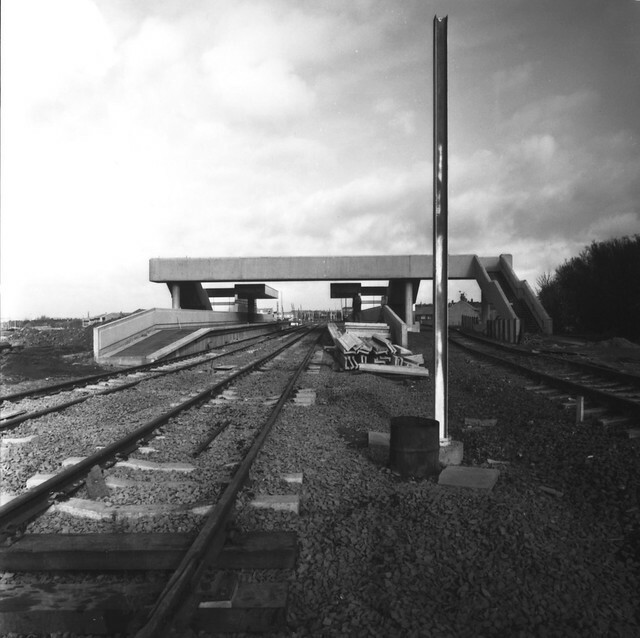 This is a photograph takes from inside the rail gang test track; it was taken some time in 1975. 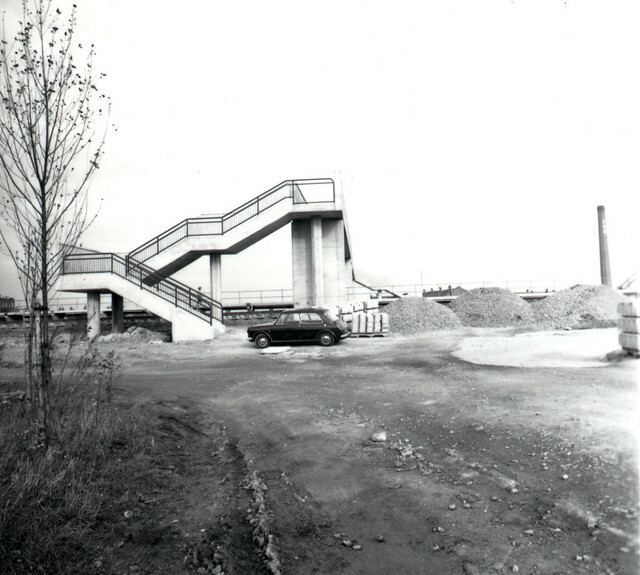 This photograph is a view of the Forth Banks trough sections and embankment, 20th October 1978. 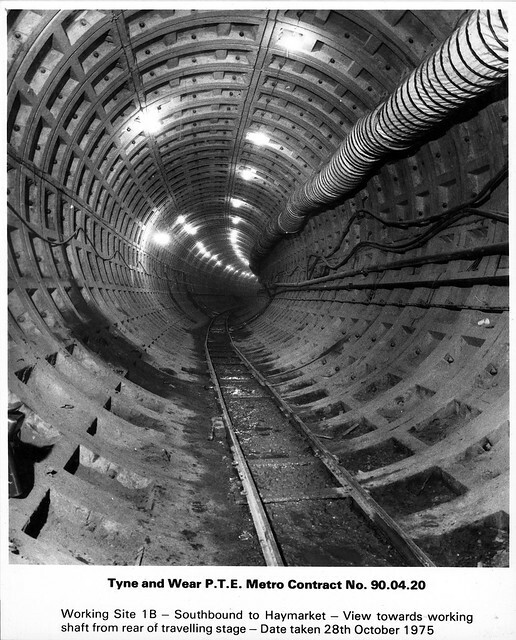 This photograph shows the south bound running tunnel to Gateshead station. 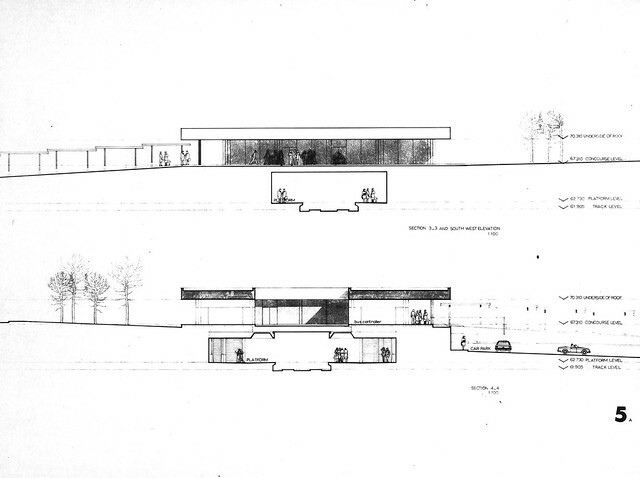 31st October 1976. 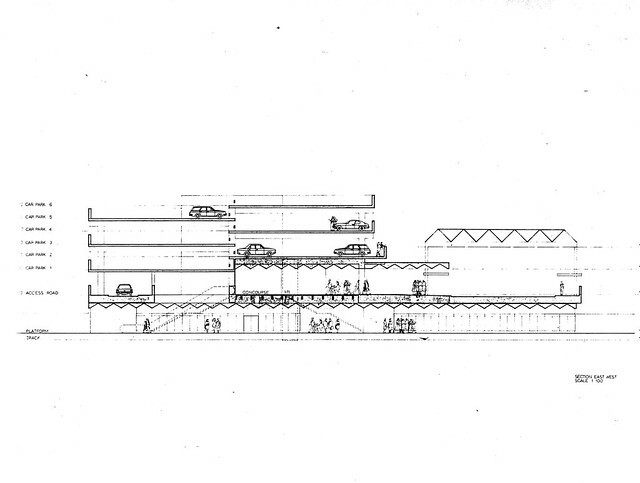 This is an artist’s impression of the Four Lane Ends Metro Interchange. 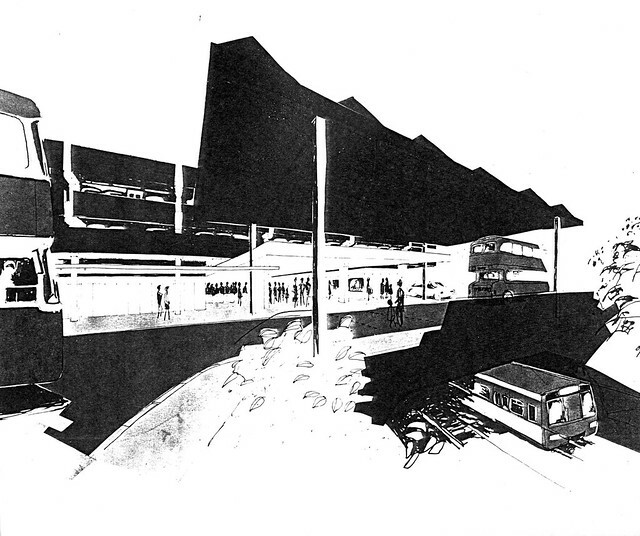 It was taken from the ‘Ainsworth Spark Photo File.’ Compiled between the 8th of December 1975 to the 12th of May 1977 it consists of artist's impressions, tender drawings, photographs of 3 dimensional models and plans relating to various Metro projects. 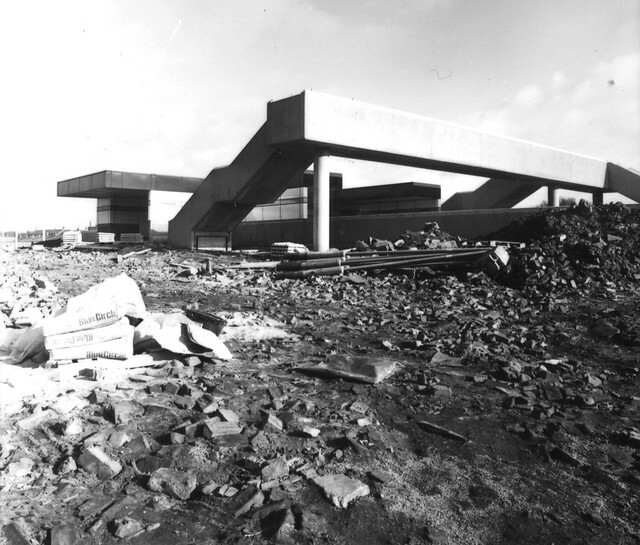 Ainsworth Spark were Newcastle based Architects. 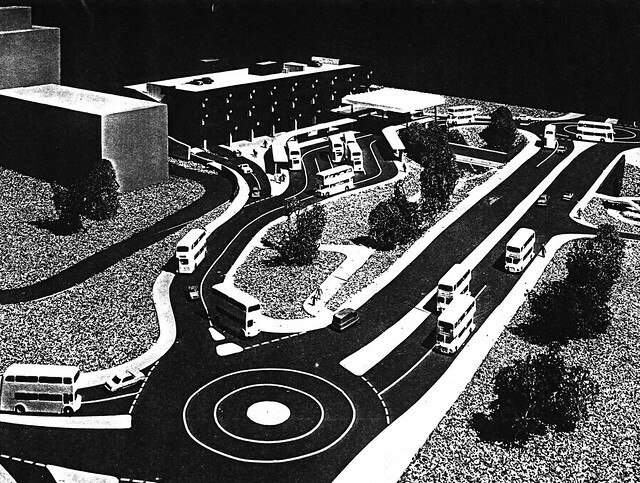 This are 3D models of the Four Lane Ends Interchange. 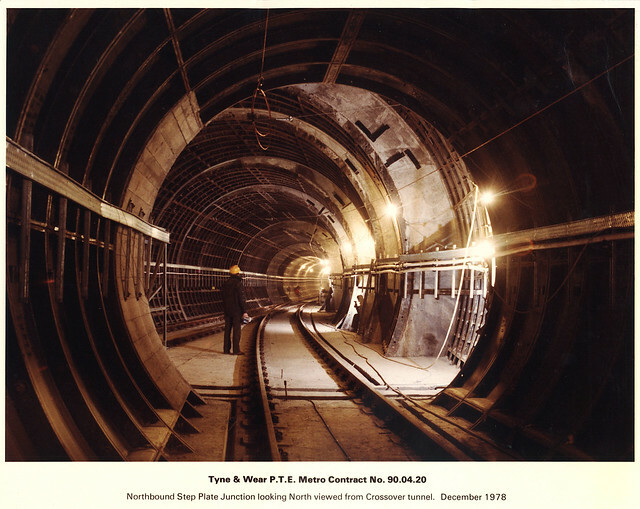 It was taken from the ‘Ainsworth Spark Photo File.’ Compiled between the 8th of December 1975 to the 12th of May 1977 it consists of artist's impressions, tender drawings, photographs of 3 dimensional models and plans relating to various Metro projects. 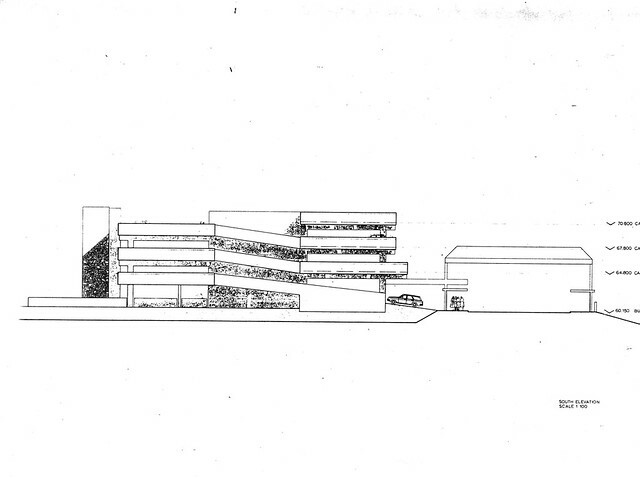 Ainsworth Spark were Newcastle based Architects. 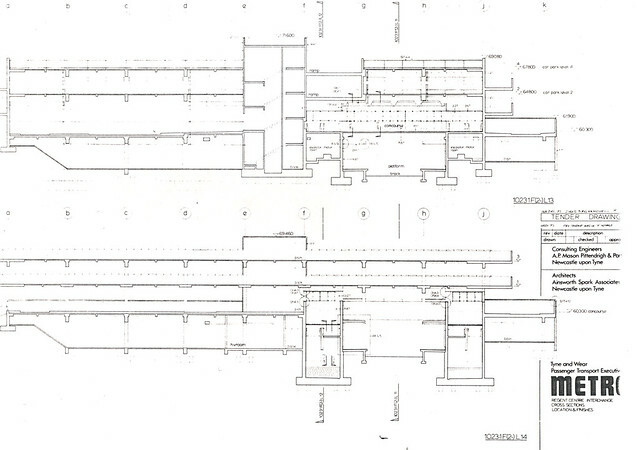 These photographs are plans of the Regent Centre Station and Multi-storey car park. 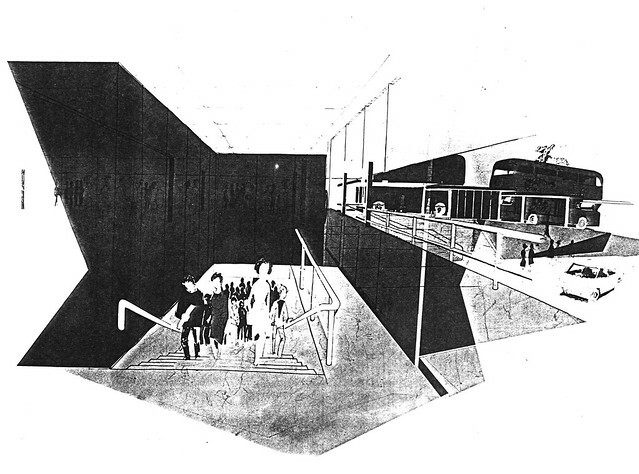 It was taken from the ‘Ainsworth Spark Photo File.’ Compiled between the 8th of December 1975 to the 12th of May 1977 it consists of artist's impressions, tender drawings, photographs of 3 dimensional models and plans relating to various Metro projects. 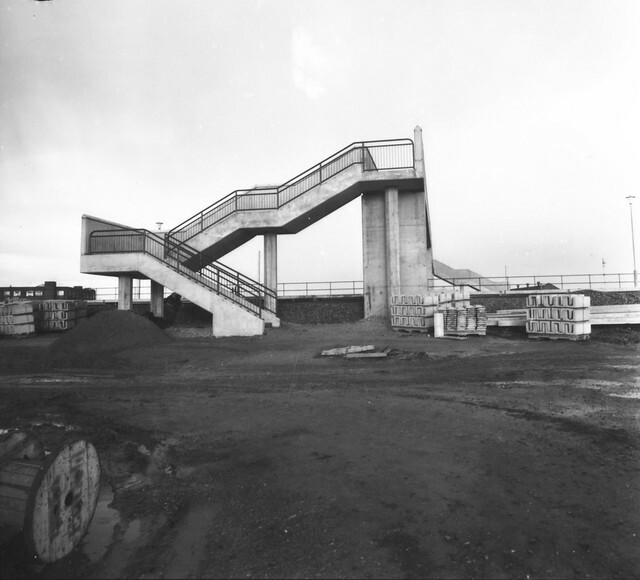 Ainsworth Spark were Newcastle based Architects. 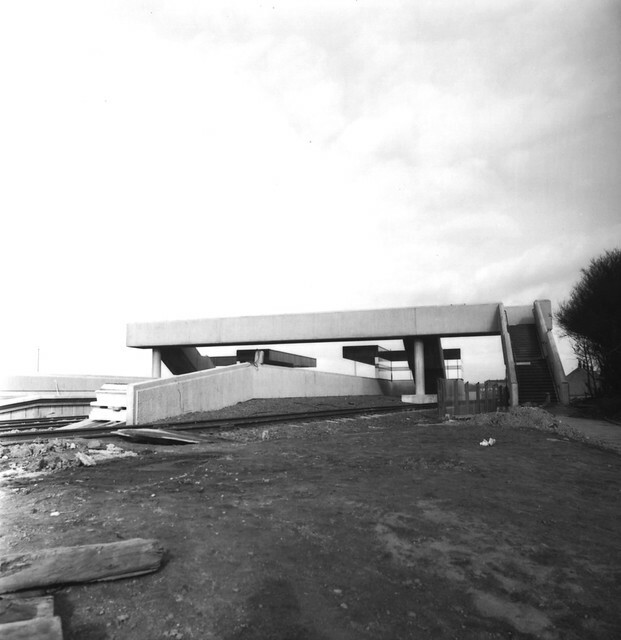 These photographs document the construction of the New Bridge, facing Bede Industrial estate. 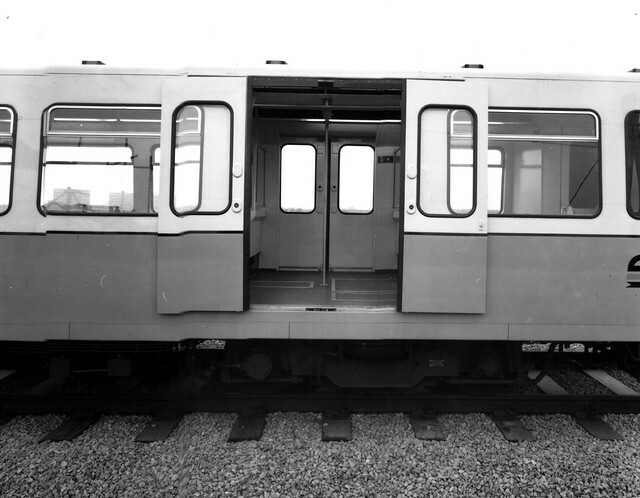 Taken some time between the 15th October 1981 to the 10 August 1982. 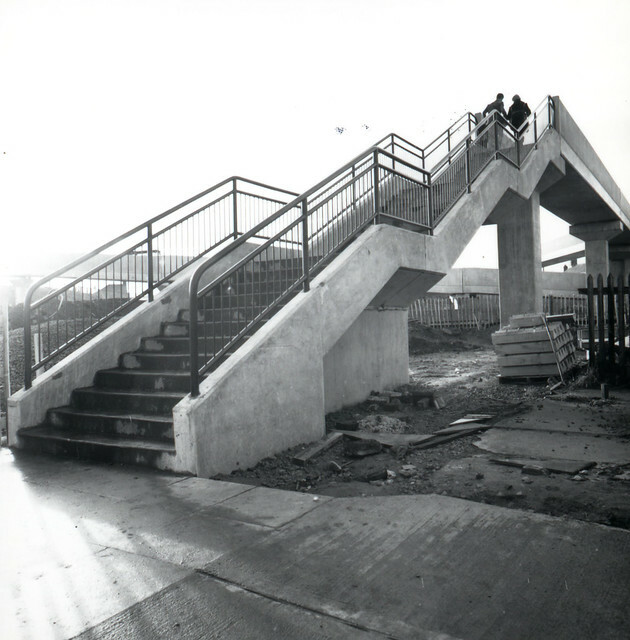 These photographs document the construction of the New Tyne Dock Station. Taken some time between the 15th October 1981 to the 10 August 1982. 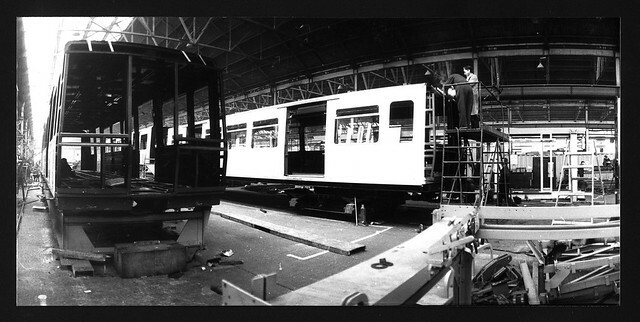 These photographs show prototype rail cars being constructed at a Birmingham Factory and test track at some time in 1975. 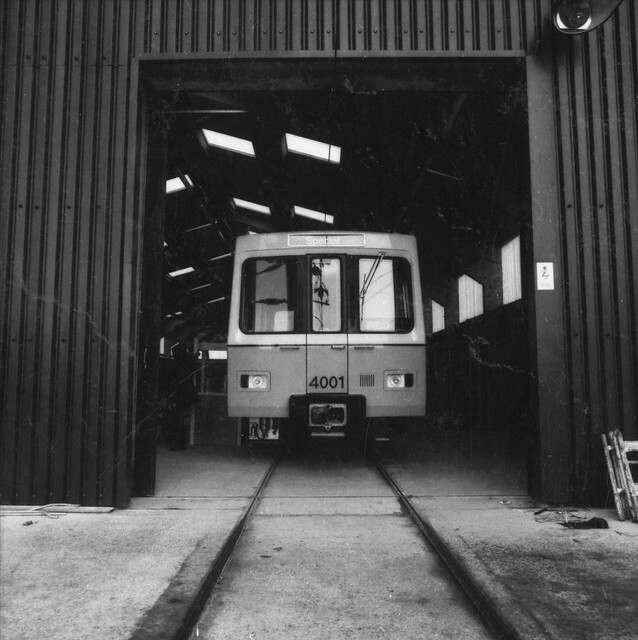 These photographs shows a prototype rail car being tested on the Metro Test Track near Backworth at some time in 1975.